The work that the travel and tourism industry does is vital to the economy. In 2017, Bloomington-Normal had 220,000 visitors and 44,611 hotel room nights, which generated an economic impact of $6,959,316. For every $1 of hotel tax received, $10.04 was returned to the local economy. Nationally, tourism is a $2.1 trillion industry. The industry is the seventh largest employer in the United States, supporting 1 in 9 jobs. National Travel & Tourism Week is an annual tradition for the travel industry. It’s a time when travel and tourism professionals from across the country unite to celebrate the value travel holds for our economy and businesses. To celebrate, the Bloomington-Normal Area Convention and Visitors Bureau has created a new event, Tour the Town. From May 5-20, participants can snap selfies of themselves visiting our participating attractions. 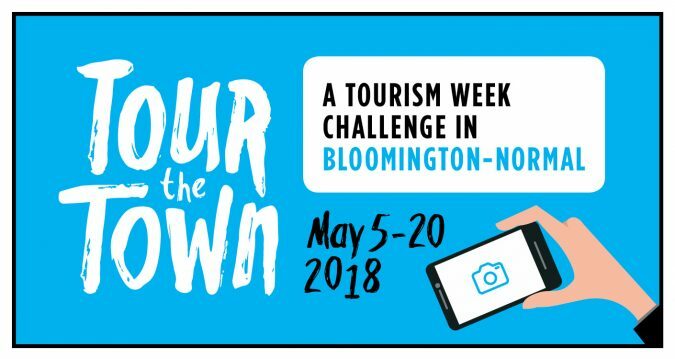 By posting them to Instagram and using the hashtag #BNTourismWeek, the Convention and Visitors Bureau will be able to judge the photos based on creativity and quantity of attractions visited. The winner will receive a gift basket that will include dinner for two at DESTIHL, two tickets to the Illinois Shakespeare Festival, a gift certificate to Carl’s Ice Cream and four passes to Miller Park Zoo. Grab your selfie stick and be a tourist in your own town. We can’t wait to see your photos!